Full name and orig. publication: Rhynchoglossum Blume, Bijdr. fl. Ned. Ind. 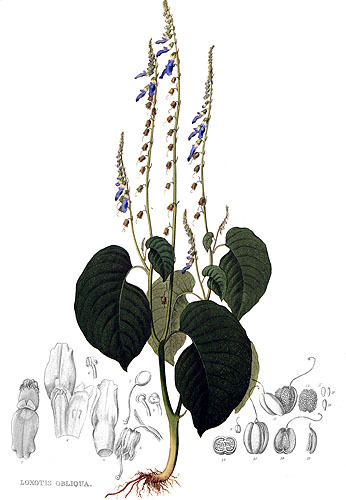 741 (July-Dec. 1826) ("Rhinchoglossum"). Etymology: From the Greek ρυνχος, rhynchos = beak; and γλωσσα, glōssa = tongue. 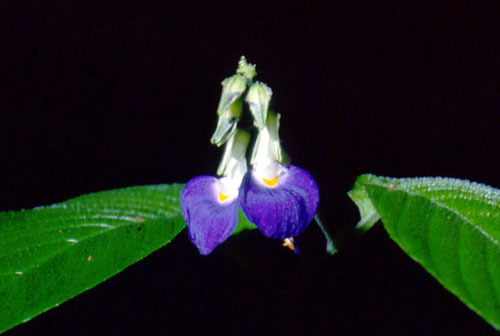 The second part of the name clearly alludes to the broad, tongue-like lower lip of the corolla, the first part perhaps to the narrow corolla tube or to the pointed petal tips. Synonyms: Antonia R.Br. in Wall. (1832), non Pohl, Klugia Schltdl. (1833), Loxotis [R.Br. in Wall., in syn., ex] Benth. (1835), Glossanthus [Klein ex] Benth. (1835), Knappia Ferd. Bauer ex Steud. (1840), Rhinoglossum Pritz. (1855). 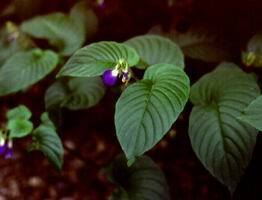 Description: Perennial or annual, monocarpic herbs, with sparse indumentum from often branched, many-celled, eglandular hairs. Stems terete, fleshy-succulent, usually branched. 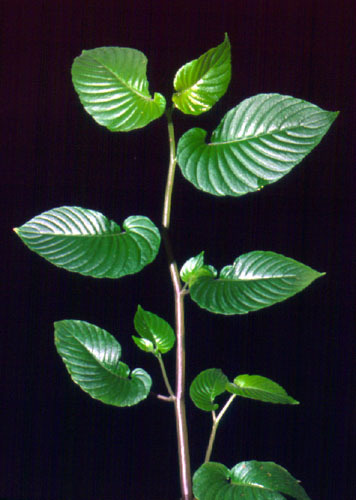 Leaves alternate, nearly distichous (‚alterniphyllous‘), shortly petiolate, lamina obliquely ovate-cordate, base asymmetrical, one half cordate, the other sinuate-attenuate; texture thin and delicate. Inflorescences terminal on main and side branches, unilateral racemes with two rows of flowers, subtending bracts small, linear, displaced onto the pedicels in most species; a few sterile bracts often present on the flowerless side of the inflorescence axis. Sepals connate in the lower half, with or without wings at the lines of fusion, lobes narrow triangular-acute. Corolla strongly zygomorphic; tube cylindrical, white; limb strongly bilabiate, upper lip of two short, upright or reclined lobes, lower lip a large, roundish or elongate, not or only slightly three-partite tongue of azure colour. Fertile stamens four (the former genus Klugia) or two (Rhynchoglossum s.str.). Ovary globose-ovoid. Fruit a globose or ovoid capsule included in the calyx, dehiscing loculicidally by 2 valves. Chromosome number: 2n = 20, 36, 42, 54. Species names (incl. publication and synonyms): See Skog, L.E. & J.K. Boggan. 2005: World checklist of Gesneriaceae: http://persoon.si.edu/Gesneriaceae/Checklist. Distribution: From India and S China to New Guinea, one (to three ?) spp. in C America (Mexico, Colombia, Venezuela). Ecology: On wet and shady (preferably limestone) rocks, in forest or open, shady places; usually in the lowlands. 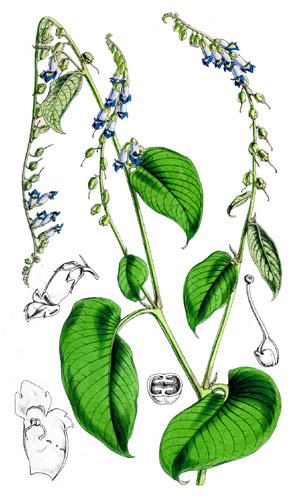 Notes: The genus is unmistakable by (a) the alternate-distichous phyllotaxis, (b) the very strongly asymmetrical leaves, (c) the terminal, unilateral-racemose inflorescences and (d) the blue-white flowers with extremely bilabiate corolla. The unique type of inflorescence is derived from an alternicladic thyrse in which the cymes have been reduced to single flowers; with secondary elongation of the inflorescences and increase of flower number. Union of the former genera Klugia (with four stamens) and Rhynchoglossum (with two stamens) proved necessary when Burtt (l.c.) found intermediate species (stamen pairs with large and small and/or sterile anthers). With regard to distribution, the recurrence of the genus in C America is most remarkable. 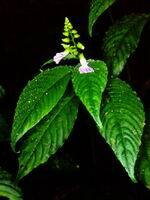 The close relationship with S Indian taxa indicated by molecular data (Mayer & al. 2003), suggest a rather recent introduction. R. obliquum has the largest area of distribution in Asia, ranging from N and S India to New Guinea, and reaching also S China in the north. It is remarkable that the presumedly most primitive species, R. omeiense W.T.Wang and R. lazulinum Rao & Joseph are found in the northern and north-western margin of the distribution area (area of origin of the genus?). The molecular data of Mayer et al. (2003) suggest that Rhynchoglossum is sister to the remaining genera of the Epithematoid Gesneriaceae. Selected references: Burtt, Notes Roy. Bot. Gard. Edinburgh 24: 167-171 (1962), prov. rev. ; Weber, Bot. Jahrb. Syst. 99: 1-47 (1978), morph. ; Y.Z.Wang, Gao, Liang & Wu, Acta Yunna. 19: 265-270 (1997), fl. morph. ; W.T.Wang et al., in Wu & Raven (eds. ), Fl. China 18: 399-400 (1998), reg. rev; Hilliard, in Grierson & Long, Fl. Bhutan 2(3): 1327-1328 (2001), reg. rev. ;Mayer, Möller, Perret, Weber, Amer. J. Bot. 90(2): 327-329 (2003), molec. syst. Bibliography: See Skog, L.E. & J.K. Boggan. 2005. 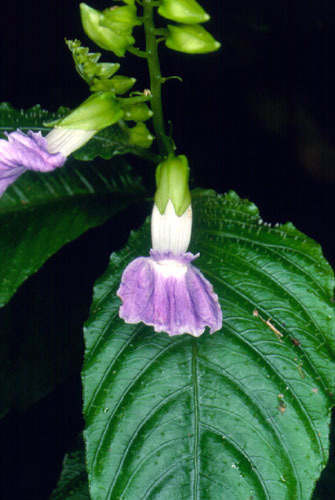 Bibliography of the Gesneriaceae. 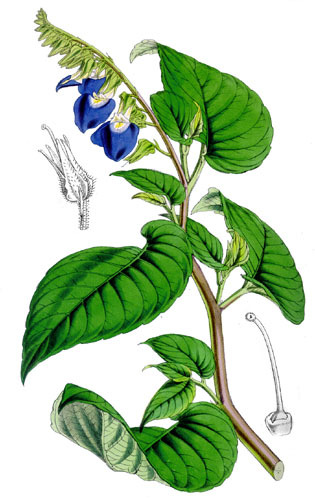 2nd edition: http://persoon.si.edu/Gesneriaceae/Bibliography.